Since the Industrial Revolution, the effects of human processes such as fossil fuel burning, urban expansion, deforestation and the use of chemicals, have put greater and greater strains on the environment, leading to problems such as pollution, resource depletion and the loss of biodiversity. Prior to the 1960s and 1970s these problems attracted relatively little attention from the public, media and governments. Of course, societies like the Royal Society for the Protection of Birds and the National Trust had been working since the 19th century. These organisations however, were primarily concerned with the conservation of wildlife and the wilderness. It has only been in the last 40 years that a rapid growth in the environmental movement has taken place, with a new range of “pressure” groups forming in response to the growing environmental problems. This period marks the birth of modern environmentalism. Among the first pressure groups to arise from the environmental movement included the Sierra Club, Friends of the Earth and Greenpeace. For these organisations, much of their work was, and still is, pro-active, involving non-violent confrontation with the “polluters”. These organisations attracted people from all walks of life, who were becoming disillusioned with the harm that modern living was causing the environment. They have campaigned for a whole range of issues, from nuclear disarmourment and the renunciation of nuclear power to the banning of whaling and the wearing of fur coats. These and other groups have played an important role in raising public awareness about environmental issues. In 1970 the world held its first “Earth Day”, attracting an estimated 20 million Americans, who took part in demonstrations against pollution. Environmental groups recognised that the way forward was to develop international co-operation to protect the environment. 1970 was declared the European Conservation Year. Two years later, the United Nations Conference on the Human Environment was held in Stockholm, and produced a declaration of principles designed to deal with specific environmental problems. 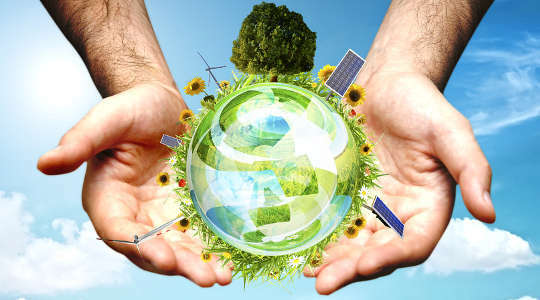 Since the beginning of the modern environmental movement more has been learnt about the environment, and the focus of environmental groups has slowly shifted from local issues to wider, national and global issues. Since that time, the world’s population has almost doubled, and rates of energy consumption and resource depletion have increasing alarmingly, to cater for the higher standards of living demanded by society. The new awareness of environmental issues brought about by the Environmental Movement has modified many traditional attitudes. Most significantly, it has become abundantly clear that many of the Earth’s resources are not limitless and are being mismanaged. The traditional imperialistic view that nature should be controlled has been modified. Imperialists have accepted that there is a need to restrain natural exploitation and pollution where the long-term effects could jeopardise humans. Similarly, Romantics of the modern era have made use of science to support their perspectives on nature, turning to the concept of Gaia and the likening of the Earths biosphere to a super-organism, with an active control system keeping the climate in a state of equilibrium. Utilitarians still believe that the only values in life are those of happiness, pleasure and contentment and that other things (such as our planet, its atmosphere and other life within it) only have worth if they fulfil these ideals. Nevertheless, the knowledge that the global ecology is important for the sustenance of greater utilitarian good has become central to much shallow or “light green” environmental thinking. Utilitarians for example, support the need to use renewable fuels and to recycle waste, since the short-term inconvenience is outweighed by the long-term benefits. In recent times the perspective of stewardship has become more radical, and the motives have shifted away from religious ones in the wake of the Environmental Movement. Where traditionally, all life was treated with the greatest respect, the modern view affords all life the equal right to live and blossom. This modern perspective has formed the basis of a lot of “deep green” environmental thinking, identified as “deep ecology” or ecocentrism by the Norwegian philosopher Arne Naess, and conceptualised by Aldo Leopold as the “land ethic”. Leopold and Naess believed that all life has an equal intrinsic value, valuable in itself, irrespective of the uses it has for humans. Furthermore, the greatest human pleasures come from sharing a close partnership with all the forms of life. Deep green ecology is sometimes called ecocentrism, since the centre of importance or value resides with nature and the environment, rather than human beings only.